Intellectual, strategic, smart and real-time decision making is a must for the development of any organization. Previous years, all those decisions made by revising, analyzing documented reports also by comprising all the data. It becomes a tedious job, poring over the reports and spreadsheets repeatedly to get on the conclusions. Data visualization becomes popular in recent years. Data visualization make decision-making process efficient. Visualizing the data in graphical or pictorial form increases the productivity because using images, charts, graphs it becomes easy to visualize, study and understands the data. Tableau: It represents the scene from history or story using motionless figures or with a group of models. Tableau is a data visualization tool and that used in business intelligence. It merely converts raw data into an easily understandable format. In tableau, all visualizations created, in the form of a dashboard and worksheets. Professionals at any level in an organization can understand the data created by tableau. Tableau, allow to non-technical users to create their custom dashboard so that non-technical users understand the result of the tableau. No need to have coding knowledge/technical knowledge to work with Tableau. Tableau has a user-friendly interface. It provides the drag and drop interface that makes smooth, to operate. Tableau connects with different kinds of data sources like MS-Excel, web data, data warehouses. It represents data in visual formats in seconds rather than months and years. Tableau Desktop and Tableau Public both used as a developer tool for data analytics. Whereas remaining product, i.e. Tableau Online, Tableau Server and Tableau Reader used as sharing tools for data analytics. This product used for creating smart visualization, for generating data stories, for the creation of workbooks, for data analysis and many more. This tableau desktop product allows users to code and customizes the reports. The user can create charts, reports and combine them all together to form a dashboard. All such a necessary and important work were done at this product. The Workbooks and dashboards can either shared locally or publicly, but the workbook and dashboard must be created on the desktop. For performing live data analysis, Tableau Desktop provide connectivity with different kinds of data sources such as data warehouses, various types of files. The user can store their reports, workbooks, and dashboards on the tableau server and work with it by merging them on the system browser. Tableau reports, visualization, dashboards can be accessed even via mobile devices. Development features and working of Tableau Desktop Personal and Tableau Desktop are similar. The personal version of the desktop keeps the workbook private. Tableau desktop personal does not allow Workbooks to publish on Tableau online. That is the reason this personal version, distributed either offline or Tableau Public. Development features and working of Tableau Desktop Professional and Tableau Desktop are similar. The professional version of the desktop keeps the workbook and dashboard public. This version allows the workbooks, dashboards to publish on tableau online, and Tableau Server. This version has full access to all kinds of data-type. This is the best option for those, who want to publish their workbooks or dashboards on Tableau Server. Only tableau desktop professionals can post their data to tableau public, tableau online and tableau server. The cost Tableau is not low. The free version of Tableau known as Tableau Public. Tableau public has two parts, from which, first is Tableau Public Desktop and second is Tableau Public Server. This version of Tableau builds for the ‘cost-effective users.’ As the name public, workbooks, dashboards created here cannot be stored locally. All the work saved into the tableau public cloud. Anyone can have access to the data, present on the public cloud. Tableau Public Desktop has some limitations compared to the Tableau Desktop. Tableau Desktop is a paid product of Tableau. Another limitation is that user can only work with local data. Tableau Public Server hosted on the Public cloud of the tableau enterprises. All the data and workbooks present on the public cloud is freely available. It is the analytics platform present on the cloud. Tableau online is similar to the tableau server, but the data stored on the server which hosted on the cloud and that cloud maintained by Tableau group. Tableau Online can be accessed from anywhere and from any device. As Tableau online is a sharing tool, the user can publish and sharedata discoveries with anyone. There is no storage limit for storing or distributing data on the tableau online. To publish the data on Tableau Online, workbook needs to create on Tableau Desktop. Tableau Online supports the data streamed from web applications such as saleforce.com, google analytics. Tableau Onile can create a direct link to multiple data sources such as MySQL, Spark SQL, Hive, Amazon Aurora, etc. Tableau Server is a sharing tool used to share workbooks, visualizations across the organization but only those workbooks and visualization created at tableau desktop. To share the dashboards on tableau server, first, you need to publish your dashboard on to the tableau desktop. It is possible to modify the worksheets, visualizations and dashboards, stories using tableau server. The only licensed user can have access permission to access the work uploaded on the server. An authorized user can check the reports via web browsers using login credentials, no need to install the tableau server on their machine. Very high security provided to the Tableau server. Quick and effective sharing of data possible because of Tableau server. It provides permission to the various projects, data sources and workbooks also. It manages security among the tableau products. It manages the collaboration between the entire tableau products. It manages the performance of tableau product. Tableau Reader is a free desktop application. Reader allows the user to read or view the workbooks and visualization created by tableau desktop or tableau public. Data modification is restricted. Tableau reader built in tableau desktop. The user can do multiple tasks such as drill down the data, discover the data and filter the data using tableau reader. Tableau reader has zero security level. If the user wants to share dashboard created by them, the receiver should have tableau reader to view the document. Data server manages heterogeneous data sources. 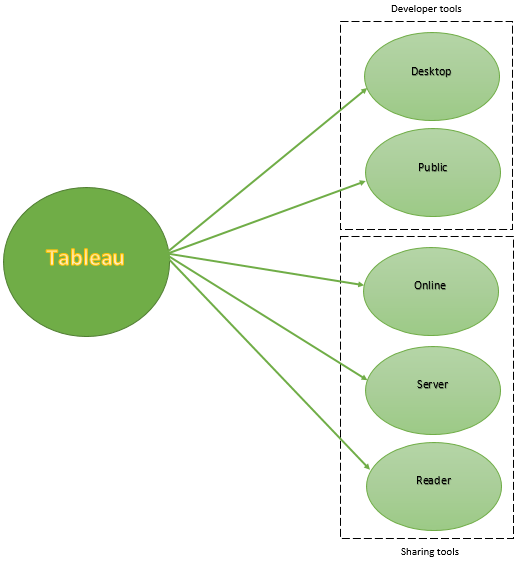 Data sources are the primary component of Tableau architecture. Tableau can connect to the multiple data sources. It can link to the web application at the same time. It also links to the excel files, database. It can connect data from different (heterogeneous) environments. It combines altogether the data collected from various data sources. It builds the relationships between different data sources. It provides a connection between the data server and external data sources, or data connector is an interface between external data sources and the data server of the tableau. 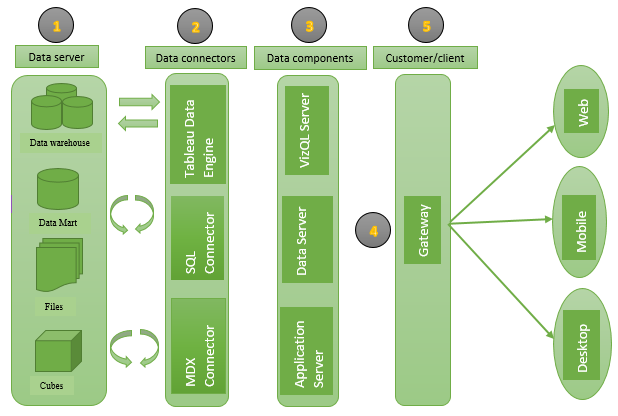 Tableau has different connectors such as ODBC/SQL connector and MDX connector. ODBC connector can connect with any database without a native connector. Tableau work either on live data or extracted data or on both data simultaneously. In many enterprises, huge database updated periodically. That time enterprise needs to work on updated data or live data. In such a cases tableau works as front- end visualization tool. It can connect to external sources using dynamic MDX (Multidimensional Expressions) and SQL statements and creates a link for accessing live data. This feature links the tableau with live data whereas importing the data. Tableau can fetch the data from external data sources and build the local copy of that data known as tableau ‘exact file’. It brings millions of records and store in a tableau data engine with a single click only. Tableau data engine uses the storage unit like RAM, ROM and Cache memory for storing purpose. Using filters tableau fetches a small amount of data from extract file or massive dataset, and this features increases performance of tableau. It records each session id on tableau server for the security purpose. It converts the queries into visualizations. When the VizQL server receives a request from the client, it sends a query directly to the data source and retrieves the information in the form of images. The result of this visualization forwarded to the client. Tableau server creates a cache of visualization that will reduce the load time. This cache can be shared with multiple users who have permissions to view that visualization. It manages the data from external sources. It is also known as the central data management system. It stores the relevant data details such as metadata, sets, parameters, groups. Load balancer processed the request when the client sent the request. Gateway act as distributor and distributes the different processes to the different tableau components. In the absence of load balancer, gateway act as a load balancer. Tableau desktop, web browser, mobile applications are the clients. Those clients can edit the dashboard and visualizations. Data visualization: Tableau is the data visualization tool. It provides the facilities for complex computations, data blending. It plays a vital role in real-time decision-making. Quickly create interactive visualization: Tableau has a drag and drop facility. The user can create complex and interactive visuals within a minute. Ease of implementation: Tableau provides multiple ways to create visuals. It becomes very easy to the end user, to choose a comfortable way of creating visuals. Tableau can handle massive data: Tableau can manage large data efficiently — different visualizations created for large data, without affecting the performance of dashboards. Use of other scripting languages in tableau: For better performance and complex table calculations, tableau allows the usage of other languages like R, python in the tableau. Mobile support and responsive dashboard: Tableau dashboard has striking reporting feature. That feature allows the user to customize the dashboard to individual devices such as mobile or laptop. Tableau dashboard identifies automatically, which device used by the user to view the reports. Scheduling Reports: Tableau does not provide the facility of an automatic refresh. Automatic refresh can be achieved with the help of scheduling. Tableau does not have an option of scheduling. Need a manual work after every modification or updation. No custom visual imports: Tableau does not allow importing the custom visuals, and user needs to create it instead. Custom formatting in Tableau: Tableau has the limited formatting option. It displays only 16 column of data only at a time. If user want to create visuals of more than 16 column or user want to create the same formatting for multiple columns, then the user needs to do it manually. Screen Resolution on tableau dashboards: If the tableau’s developers screen resolution is different from the screen resolution of clients, then the layout of the dashboard get distorted. Moreover, the dashboard will be no longer responsive. In that case, either the screen resolution of developer and end user should be same or developer has to create a dashboard to view it on mobile. Limited data preprocessing: a Tableau is a visualization tool, it provides only basic facilities such as blending data, joining data but it does not provide cleaning data facility. Data cleaning is a necessary step.